The wild modern dance routine that is feeding your child in their highchair has commenced. Your only choice is whether the spoon is going to be a train or a plane. As it swoops around their head and they laugh, you notice something. One of their bottom teeth is starting to show. This gets you thinking, “When should I take them to the dentist?” Should you wait for the tooth to come in? How about until they all do? Dr. Layne Benzley, your children’s dentist in Castle Rock, tells you everything you need to know about your child’s first dental visit. When Is It Time For Their First Visit? The American Academy of Pediatric Dentistry has a simple way to answer this question: “First visit by first birthday.” The longer answer is that you should bring your child in 6 months after their first tooth has erupted, or no later than their first birthday. These early visits are essential for setting your child on the right path for healthy teeth. They will give Dr. Benzley the chance to examine your child and see how their teeth are developing. The earlier he is able to notice a potential problem, the easier it will be for him to treat it. It is also an ideal opportunity for you and your child to ask any questions you might have about their oral health. This will help get them started thinking about their teeth. You can discuss the value of brushing and flossing, how their diet affects their teeth, and what to expect as their teeth develop. By taking care of their teeth early, this will help your child have a positive connection to going to the dentist and taking care of their teeth, ensuring they will want to in the future. When you bring your child in for the first time, the visit will start with the team greeting them and trying to help them feel more comfortable. The session will start with you talking with Dr. Benzley about your child and discussing any medical history or observations that might be relevant. After this, he will perform an examination and clean their mouth and gums while your child is laying down in your lap. 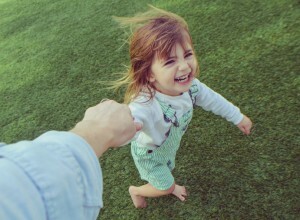 This will help ease their anxiety in an unfamiliar situation. At this point, he’ll make suggestions for what you and your child can do to keep their teeth healthy as time goes on. 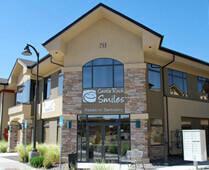 Just like yourself, be sure to bring them in regularly for check-ups after the first visit. This will give Dr. Benzley the chance to monitor their progress and make sure everything is going smoothly. This will also allow you to ask any questions you might have as your child’s teeth grow and change. 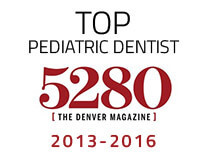 If you’re still asking yourself, “Do I need to take my child to the pediatric dentist in Castle Rock, yet?” please give us a call. We’re more than happy to answer any of your questions. Your child’s health is important to you, so help keep their smile bright and come see us!